↑ "Alabama Department of Archives and History, Alabama Emblems: Official Freshwater Fish". www.archives.state.al.us. ↑ "Alabama Department of Archives and History, Alabama Emblems: Official Saltwater Fish". www.archives.state.al.us. ↑ "The Alaska State Chamber of Commerce :: Student Guide :: State Symbols". ↑ "ASLAPR - Museum Division". ↑ "History and Culture - California State Symbols - California State Library". www.library.ca.gov. ↑ "KIDS: State Fish". www.ct.gov. ↑ "State of Delaware - Redirect Page". portal.delaware.gov. 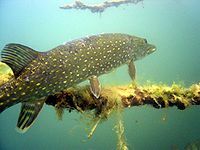 ↑ Official state freshwater fish. The 2007 Florida Statutes: Title IV, Chapter 15.036. ↑ 12.0 12.1 "Georgia State Symbols". ↑ "Governor C. L. "Butch" Otter - The State of Idaho - FYI Idaho State Symbols". ↑ Senate Joint Resolution 2001. Iowa General Assembly. ↑ "Kentucky State Symbols - Kentucky Department for Libraries and Archives". ↑ "Secretary of State Kid's Page". ↑ "Rockfish (Striped Bass), Maryland State Fish". msa.maryland.gov. ↑ "General Law - Part I, Title I, Chapter 2, Section 13". malegislature.gov. ↑ "Minnesota Legislative Reference Library - Minnesota State Symbols". www.leg.state.mn.us. ↑ "State Symbols of Missouri - Missouri Secretary of State". www.sos.mo.gov. ↑ 1-1-507. State fish, Montana Code, accessed 23 April 2009. ↑ "File Not Found - School of Natural Resources - University of Nebraska–Lincoln". snr.unl.edu. ↑ "Section 3:20 State Freshwater Fish". www.gencourt.state.nh.us. ↑ "New Hampshire Almanac - NH.gov". www.nh.gov. ↑ "New Jersey State Fish". ↑ "New York State Fish - Brook Trout: NYS Emblems: New York State Library". www.nysl.nysed.gov. ↑ "New York State Emblems". ↑ 36.0 36.1 "North Carolina Secretary of State". www.sosnc.gov. ↑ "Home - North Dakota State Government - ND Portal". www.nd.gov. ↑ "SC Statehouse Student's web page, State Symbols and Emblems". South Carolina General Assembly. Archived from the original on 2007-06-22. Retrieved 2007-07-16. 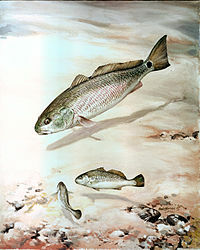 ↑ "Texas State Fish] - Guadalupe Bass". statesymbolsusa.org.